When friends invite you over to watch their home movies, that’s usually the time to say you’ve got other plans. Ross Williams, on the other hand, has made a documentary about his wife Kristan’s pregnancy and the birth of their child, Ash, which turns out to be not such a bad way to spend an evening. The film starts out very promisingly, with an excellently edited and fun “day in the life” sequence, followed by a nicely animated opening title sequence (by Adam Crockett). After all that, though, the movie settles into a more traditional structure. We learn all about Ross and Kristan’s romantic background, re-constructed through old photographs, including their wedding in a projection booth during a screening of Crouching Tiger, Hidden Dragon. Yeah, they’re a couple of movie nerds. Ash, their kid’s name, is named after Bruce Campbell’s character in the Evil Dead movies. Ross also has a history of directing short films and goes about obsessively filming his life with a camcorder. Kristan, luckily, is a creative type, too, so she’s game. They’re both very open and natural on camera. There are a few twists and turns along the way, but the story of the pregnancy evolves along fairly traditionally, so what propels the film along really is the good-natured humor of the expectant parents. They seem like a pair of good folks who are good together about to bring a child into a nice world. While I don’t have any kids yet myself, I’ve known a couple of new parents the past couple of years, so there’s not much I learned from Ross and Kristan that I hadn’t heard expressed already by people I’ve known personally. 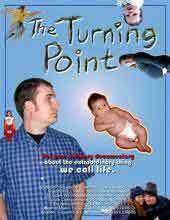 Plus, there’s plenty of these kinds of shows about childbirth on basic cable these days that there’s not much fresh or revelatory or overly dramatic in The Turning Point. But that doesn’t mean it isn’t entertaining. But I do wish it were a little more experimental as the opening promised, but at least the film doesn’t skimp on showing the intimate personal details, nor is Ross shy about putting on camera his disappointment when the going gets tough the first few weeks when the newborn isn’t much more than a wailing, shitting lump. Of course, I don’t know how the kid’s going to feel about that when he’s old enough to watch the film. Thanks for the review Mike. I’m glad that you enjoyed the film for the most part. As to it being similar to all the baby shows on Discovery Channel and such; that is actually one of the reasons I felt I needed to make the film. We watched all those shows while we were pregnant and after having Ash, I realized that they never fully covered what it’s really like to have a kid. The shows are all the same, you get to know the couple for a minute while they’re pregnant, they spend the next 15 minutes having a baby, then the last few minutes is a happy little wrap-up. With The Turning Point I tried to be as honest as possible through the whole thing. All our thoughts and fears leading up to it and the struggle with learning how to be a parent afterwards. While the film is nowhere near perfect, I think it is the best filmed representation of what it’s really like to have a kid for the first time. I hope that future parents can become a little more prepared and have a good time with it.